StarCraft 2 may surpass chess as the "model organism" used by science in the study of human cognition. For decades, chess has served as a sort of focal point for cognitive scientists attempting to determine, among other things, why human brains are so good when focused on individual tasks and so bad when their attention is divided. The game has actually been referred to as "the drosophila of cognitive psychology and artificial intelligence" [here, let me google that for you] because it "represents the domain in which expert performance has been most intensively studied and measured." But there's a new kid in town that threatens to upend that old applecart, and its name is StarCraft 2. StarCraft 2 is gaining attention in the scientific community because of the complexity it brings to the table. It forces players to pursue multiple goals simultaneously, often under intense pressure and within small windows of opportunity, and serves up scenarios that can change rapidly and unpredictably. There also happens to be a ton of players, which offers a potentially huge pool of data for researchers to draw from. 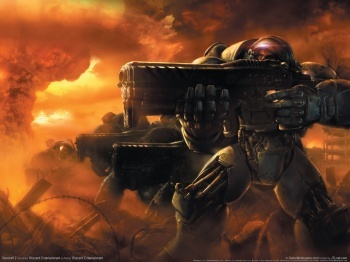 "I can't think of a cognitive process that's not involved in StarCraft," Mark Blair, a cognitive scientist at Simon Fraser University, told Scientific American. "It's working memory. It's decision making. It involves very precise motor skills. Everything is important and everything needs to work together." Blair is actually running a project at the university called "SkillCraft", which is currently looking at more than 3500 StarCraft 2 replay files collected from players across a wide range of skill levels. "What we've got is a satellite view of expertise that no one was able to get before," Blair explained. "We have hundreds of players at the basic levels, then hundreds more at level slightly better, and so on, in eight different categories of players." The hope is that a comparison of the techniques and styles of low-level players with those of more advanced skills will allow researchers to begin to understand how skills develop and how to most efficiently train them. "For emergencies, you don't get to train eight hours a day. You get two emergencies in your life but you better be good because lives are at stake," he added. "Training in something like StarCraft could really be useful."